Many thanks to the highly prestigious World Haiku Association for its decision to give World Haiku Association Award 2019 to Cyberwit.net. I along with Karunesh Kumar Agarwal both feel grateful to Ban’ya Natsuishi and Sayumi Kamakura for such act of kindness. Both of us got a golden opportunity to meet Ban’ya Natsuishi and Sayumi Kamakura for the first time in a highly impressive 20th Annual International Literary Festival Druskininkai Poetic Fall, 2009. No doubt, Cyberwit has always endevoured to encourage the appreciation and writing of haiku poetry across the globe. This is evident by the fact that our publishing house has regularly featured latest haiku by the contemporary international poets in our literary journal Taj Mahal Review published in June and December annually. We also regularly include best haiku in our another prestigious journal Harvests of New Millennium published annually. I have a great deal to say concerning Cyberwit’s haiku poetry publications. Those who wish to understand this will agree with the fact that Cyberwit has also published an increasingly large number of haiku poetry collections and anthologies including poets from different nations of the world. But although we receive a large number of haiku submissions, we feel it is necessary to select only really artistic haiku for publishing in our anthologies and literary journals. The best haiku always create an enlightened awareness, ‘the aha! moment’ or `distillation of a moment’. In the contemporary world full of chaos and anxiety, haiku has been aptly described ‘islands of sanity’. It is true that nowadays the readers due to their hectic life seldom have time to read longer poems and novels. That is why haiku has become immensely popular all over the world. It may be added that Cyberwit has also published critical books about the major haiku poets. The main aim of publishing these books is the elucidation and critical interpretation of the most renowned haiku poets. Some of the most significant haiku criticism books published by Cyberwit are The Poetic Achievement of Ban’ya Natsuishi, Ban’ya Natsuishi’s World of Dreams: An Intensive Study of Selected Haiku, The Haiku of Sayumi Kamakura: A Critical Study, and Haiku Meets the 21st Century: the Haiku of Sayumi Kamakura by Mary Barnet. 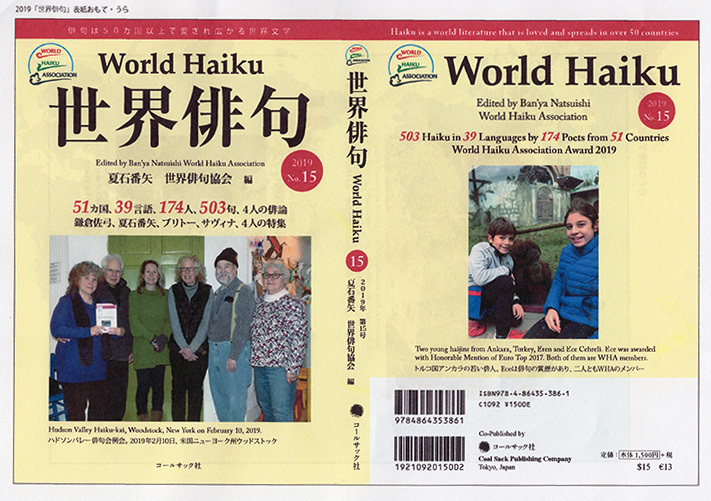 WHA website will have a page where you members can share photographs of your local haiku activities, and haiku books you publish. We accept your submissions all year around. Among the submissions, we will select some and print them in the WHA anthology. ＊Explanation of the photos such as: date and name of the event, names of the people in the photos, publisher’s name and date. Please write them in English.